Event Post Week of March 30--It's Holiday Time. Judith Claire Mitchell this Wednesday, April 1, 7 pm, and Next Monday, April 6 is Middle Grade Mania, at 6:30 pm. We've got just one event this week, and one preview for next week. Wednesday, April 1, 7 pm; Judith Claire Mitchell, author of A Reunion of Ghosts. Mitchell's novel, ten years in the making, went on sale last Tuesday, and in its first week out, had a substantial pop on our bestseller list. Here's Boswellian Jen Steele's recommendation, which also gives a little background about the book: ""The sins of the fathers are visited upon the children to the 3rd and 4th generations." These are the words that the Alter sisters live by. It has become their motto and this conviction becomes part of the reason they have chosen to die at their own hands on December 31st, 1999. Lady, Vee and Delph Alter have written a suicide note together, which is more than a "goodbye, world" note; it's also a family history. You see, the Alter sisters are descendants of Lenz Otto Alter and Iris Emanuel Alter. Lenz was a chemist and the creator of the poison gas that was first used in WWI. Iris was the first woman to earn a PhD in chemistry and the first in the family to commit suicide. A Reunion of Ghosts is a captivating chronicle of a family and the weight of consequences, which grows heavier with time." Jeanne Kolker in The Wisconsin State Journal offered this take: “A Reunion of Ghosts is dark, yes. But Mitchell carries readers along for the ride on prose so thoughtful and nuanced that one can forgive the morbid subject matter. Mitchell, whose previous book The Last Day of the War (2004) was set during World War I, crafts a narrative that looks boldly at the legacy of the man who invented the chemical process that would be the precursor to Zyklon B, the gas used in Nazi concentration camps." Read more about the book, including a profile of Mitchell, who teaches at the University of Wisconsin-Madison, on their website. Margaret Quamme in The Columbus Dispatch, is another fan. She notes that "Mitchell’s plot, which twists in unexpected but believable ways and opens up just when it seems as if it can only close in, is thoroughly satisfying, but it’s the tone of her novel — that ability to savor joy and sorrow at the same time — that makes it remarkable." Monday, April 6, 6:30 pm: Middle Grade Mania! Calling all Middle Grade Maniacs!! We’re throwing a pizza party in your honor! After an introduction by Boswellian Phoebe, we’ll hear from a panel of five excellent middle-grade authors, who will talk about their books (signing copies, of course! ), after we toast our favorite teachers (with shopping passes!) and indulge in pizza. Fun for ages 8 and up, you won’t want to miss this fun event. Here's a roundup of tonight's authors. Seattle musician Steven Arntson, author of The Wikkeling, presents his latest novel, The Trap, in which science fiction, kidnapping, and first crushes combine for a thrilling fantasy that’s Gary Schmidt meets Madeleine L’Engle. From its starred review in Kirkus: " This riveting science-fiction mystery is much more than an exciting read. The subtle world may be dangerous, but Henry and his friends find that the real world poses its own challenges. Together, they grapple with racism, poverty and alcoholism, all while nursing their first crushes and dealing with the angst of the upcoming fall formal. Arntson folds all of these elements into his narrative without compromising pacing or characterization one bit." Savvy meets Three Times Lucky in Faith Harkey’s debut novel, a small-town Georgia tale of twelve-year-old Genuine Sweet, a hardworking but poor (and hungry!) “wish fetcher” who can grant anyone’s wishes but her own. Kirkus Reviews writes: "Through it all, Genuine learns about forgiveness, responsibility and empowering others while remaining true to the humble, spunky girl at her core. A folksy first-person narration combined with a thought-provoking storyline makes this a good pick for solo enjoyment or book club discussion." Eddie Red Undercover: Mystery in Mayan Mexico is the fun and fast-paced second installment of the Edgar-nominated series by Marcia Wells in which Eddie Red and his best friend Jonah must once again rely on Eddie’s drawing skills and photographic memory to uncover clues to catch a crook when Eddie’s father is falsely accused of a crime. From Gesse Stark-Smith in School Library Journal: " All three kids are realistic and likable, and although the plot twists may strain some reader's suspension of disbelief, they're fast paced enough to keep those who crave adventure turning pages. Refreshingly, this book features an African American protagonist. Purchase for libraries where the first book or other plot-driven mystery series are popular--and be prepared to add future installments." Adventures of Jo Schmo series and Melvin Beederman, Superhero series, Greg Trine, debuts the first book in his hilarious new series, Willie Maykit in Space, in which our stalwart hero, Willie Maykit, is stranded during a class trip to outer space, where his wits tested against the monsters of Planet Ed. From Kirkus Reviews:"Readers new to chapter books and who like to laugh often will most likely find Willy’s story peppered with just enough silly humor (monster poop!) to keep the pages turning." Magic beans quickly lead to danger in One Witch at a Time, the new standalone companion to The Brixen Witch by Jump the Cracks author—and our special guest for Middle Grade Mania!—Stacy DeKeyser. From Kirkus: "...the characters are awfully likable, and this tale is set so believably in a traditional Alpine world that it's easy to go along with the make-believe. A satisfying, stand-alone sequel that will certainly send readers back to read The Brixen Witch." We'll have pizza from Ian's, giveaways, and a $5 coupon off of $25 or more purchase for each educator at the program. This coupon is for personal use, not on school charges, and works on already discounted titles, and in conjunction with Boswell Benefits coupons. Good thing Kirkus reviews so many kids' books! I should also note that we're open 10 am to 5 pm on Easter Sunday. Harlan Coben is one of those exceptions that prove the rule, a series author who found greater commercial success in stand-alones. The Stranger features a classic everyman who is confronted by a stranger with a secret involving his wife, that she faked her pregnancy. When he tells his wife, she disappears, and Price finds out that this is just the tip of the iceberg. Coben talked to Mark Rubinstein about the book for The Huffington Post. The annotated Pioneer Girl leaps to #2 on The New York Times bestseller. A lot of media graciously waited until the book was back in stock at retailers. Here's an essay from April Bernard in The New York Review of Books about the project. From her essay: "I learned that there has long been a full-blown Wilder industry, with branches to be found at the South Dakota Historical Society, something called the Pioneer Girl Project (producers of this volume), the Little House Heritage Trust, the Laura Ingalls Wilder Historical Home and Museum in Missouri, the Ingalls Homestead in De Smet, South Dakota, and the university presses of, among others, Kansas, Nebraska, and Missouri. Some interesting questions of historical accuracy and interpretation do arise in this volume—chiefly, for me, to what extent Wilder’s daughter, Rose Wilder Lane, edited and rewrote her mother’s prose (not nearly as much as others have speculated, is my conclusion)." I could just recap a whole bunch of events and be done with it, but we can't not mention Liam Callanan's lovely launch for Listen and Other Stories. In addition to a full house (as Mel mentioned in her blog, one of the largest of these sorts of launches that we've done), we offered to host the after party as well, which we've only done once before. Another store told us that they close their store for all sorts of parties, and that anyone who is anyone is now planning a birthday there. I am guessing that said store closes before 9, but for the right setup, we might be amenable, especially on a Saturday. Callanan discussed his new collection with Mitch Teich on Lake Effect. He noted: "I still feel like short stories are really concerned with a moment; the moment in particular when everything changes for a character. After that moment, nothing is the same as it was for the character at the core of it." Listen (of course) to the whole interview on WUWM's website. Finally an appearance by Fresh Off the Boat, the memoir that inspired the new hit comedy series on ABC. But don't expect the heartwarming riffs of the series from the source material. Brian Hen of The Korea Times writes: "Where Huang’s memoir is raw and gritty, the show is funny and heart warming. Both are entirely different products at their core and are aimed at different audiences. When he lost most of his creative control to ABC it was honestly for the best. Maybe not in his eyes, but for many Asian Americans who have struggled to find a positive voice in American pop culture, it felt like a step in the right direction." And the good news is the show will help more people discover the memoir. There are certain kinds of books that are classified as books or not, depending on whether Amie or I buy them. For the most part, The New York Times excludes them from bestseller reports but I think Bookscan does not. The problem is that when you buy sticker books (or even board books) from a vendor like Melissa and Doug or House of Marbles, a lot of folks use the item number, instead of the EAN number, and so Bookscan can't really tabulate the purchases. Whenever we can, we use the latter, but I still removed an Easter sticker book from our printed list today, clearing the way for a still Easter-themed Llama Llama Easter Egg. Over at the Journal Sentinel, Jon M. Gilbertson reviews Billie Holliday: The Musician and the Myth, from Jon Szwed. He writes: "When an artist's life is eventful, the most responsible biographer can accidentally or deliberately neglect the art, and the life of jazz singer Billie Holiday was incredibly eventful in the 44 years between her 1915 birth into crushing Baltimore poverty and her 1959 death in a Harlem hospital bed." Editor Chris Foran reviews four baseball books for younger readers, including Remember My Name: My Story From First Pitch to Game Changer, by Mo'ne Davis with Hilary Beard. The book may be recommended for readers 8-12 but a lot of adults are excited about Mo'ne's story, including at least one host on Wisconsin Public Radio. Other books in Foran's column are Growing Up Pedro: How the Martinez Brothers Made It from the Dominican Republic All the Way to the Major Leagues, by Matt Tavares, Amazing Aaron to Zero Zippers, by Matt Nadel, a young baseball blogger, and Pinstripe Pride: The Inside Story of the New York Yankees, by Marty Appel. Foran has kept busy! He's also got his annual roundup of baseball books for older folks (older than 10, anyway). Wednesday's Journal Sentinel food section (Fresh) had similar foodie roundups. Here's their roundup of 11 foodie books for kids and foodie fiction selections too. Plus Mark Johnson reports on the possible end for the Dictionary of American Regional English project at the University of Wisconsin-Madison. For over 50 years, they have been compiling words from over 1000 communities across the country. The last printed volume (Z) came out in 2012, but with so many changes, digital updates were always in progress. But cuts to state budgets mean, well, read the article. Erik Larson Sold Out, but You Can Still Attend Carson Ellis on Wednesday, Liam Callanan on Friday, and Judith Claire Mitchell Next Wednesday, April 1, All at Boswell. Tuesday, March 24, 7 pm at Boswell: our sold-out event with Erik Larson, author of Dead Wake: The Last Crossing of the Lusitania. The good thing about reading this blog regularly is that you probably got enough warning to buy your tickets to Erik Larson's event on Tuesday before it sold out. For those who weren't paying attention, it is in fact sold out. Here's what else you need to now. a. Boswell will be closing to the general public at 5:30 pm on Tuesday. b. All folks with tickets should arrive by 6:45 pm to make sure they get a seat. After that, we will sell a limited number of standing-room tickets, which are also $30 and have the same option as the regular tickets (a copy of Dead Wake or a $22 gift card). c.Your copy of Dead Wake will be autographed. If you'd like to get your book personalized (with a name - no messages please), there will be a signing line afterwards. Folks will line up by line letters. We'll start giving out line letters around 5 pm. If you are getting more than 4 books signed (most likely a dealer), we ask you to wait until after everyone else has gotten their books signed. d. Yes, you can take photos, with these caveats. No flash, no posed photos on line, and please, no video taping. e. And finally, we do have enough copies such that we can get a book signed for you, with one caveat. You must purchase the book first to guaranty getting the book signed, even if it's signature only. You can personalize, but names only, no messages. f. I should note that our next ticketed event is for Neal Stephenson, coming for the release of Seveneves. He's at Boswell on Friday, June 5, 7 pm, and tickets will go on sale by April 1. Wednesday, March 25, 7 pm, at Boswell: Carson Ellis, author and illustrator of Home. It's not often that a first-tme author/illustrator gets the kind of enthusiasm that Carson Ellis is generating, but that's partly because she's already illustrated many beloved books, from Trenton Lee Stewart's Mysterious Benedict Society (only the first volume) to Lemony Snicket's The Composer is Dead, to the Wildwood series, with husband Colin Meloy. One of the books that was no longer available was Dillweed's Revenge: A Deadly Dose of Magic, which she illustrated for Wisconsin's late beloved author, Florence Parry Heide. I would like to note that Heide's niece, Leslie Parry, is appearing at Boswell on Friday, May 15, 7 pm, for her first novel, Church of Marvels, but I digress. I've been saying to folks since Amie was sold the title and fell in love with it that Home will surely be up for some sort of award at some point. Of course there are not that many awards to be had in the picture book world (whereas an adult novelist might strike out at the big three and still win the PEN/Faulkner or Dylan Thomas or other equally prestigious prize) but I did notice that she showed up on some mock Caldecott ballots and I think this book actually qualifies for 2016's awards. Here are a couple of official Boswell recommendations of Home. From Barbara Katz: "Readers can anticipate a treat coming when they view the striking cover of Home and see its bright red endpapers. The large pages feature many homes, such as the artist's home on the front and pack pages, a bus home, and even a shoe home! Bold illustrations done in gouache and ink feature muted colors accented with bright red and yellow. Small details in each picture create a story for the reader to imagine. Fun touches include a bird appearing throughout the book, and surprises in the artist's studio. This beautiful book invites readers to interact with it, as they think about other homes and also answer 'Where is your home? Where are you?'" And from Boswellian Jannis Mindell, another recommendation of Home: "What is your concept home? Is it the physical building where you live or the place that connects you to the larger world around you? These are some of the questions tackled in the beautiful picture book written and illustrated by Carson Ellis. The simple text is perfectly matched by the gorgeous and rich illustrations showing various different homes. Some are in the country and others in the city, some are under the sea while others live in a hollow in a tree. Careful and observant readers will find picture clues in some of the final pages. A great addition to any picture book collection!" Friday, March 27, 7 pm, at Boswell: Liam Callanan, author of Listen and Other Stories. Ever since we opened Boswell, one of our staunchest supporters has been Liam Callanan, professor of English and Creative Writing at UWM. He's not only talked up our events, but encouraged student readings too, from UWM's United We Read program for the graduates and another for the St. Robert elementary school students. But we've really never celebrated one of Callanan's own books, so it's a very special treat that his new collection, Listen and Other Stories, is finally out. But it's not just the programming he's helped us with. Liam Callanan is a true FOB (Friend of Boswell), providing support and encouragement, and more than a few laughs. In fact, if I spot anyone in the Callanan clan at Boswell, my happiness quotient immediately goes up a few notches. Here's a write-up from Ann Christensen at Milwaukee Magazine: "In his new Listen and Other Stories (Four Way Books), MKE author Liam Callanan begs for an ear. He has a willing set right here. The protagonists in these disparate, nuanced stories are connected by the universal need to be heard. That moment might be precipitated by an event, life-changing (such as the gay man who captures his lover’s last breath inside a balloon) or not. We’re bystanders, pulled along eagerly, only knowing so much. But enough. Callanan, a professor in the English department at UW-Milwaukee, explores “voice,” letting events unfold without resorting to pathos. Listen carefully." Want to read more before attending on Friday? I love this column about exploring Paris with children and books that was published in The Wall Street Journal. And then we have a little break, first while I visit my Mom and sister and go to a gift show in Boston and Worcester with Kirk, and then we run up against Good Friday, Passover, and Easter. But we do have one upcoming event which makes the whole week, Judith Claire Mitchell's long-awaited second novel, A Reunion of Ghosts, which goes on Sale March 24. Our event is Wednesday, April 1, 7 pm, at Boswell. Here's Boswellian Jen Steele's recommendation of A Reunion of Ghosts, which will give you a handle on the book. "'The sins of the fathers are visited upon the children to the 3rd and 4th generations.' These are the words that the Alter sisters live by. It has become their motto and this conviction becomes part of the reason they have chosen to die at their own hands on December 31st, 1999. Lady, Vee and Delph Alter have written a suicide note together, which is more than a "goodbye, world" note; it's also a family history. You see, the Alter sisters are descendants of Lenz Otto Alter and Iris Emanuel Alter. Lenz was a chemist and the creator of the poison gas that was first used in WWI. Iris was the first woman to earn a PhD in chemistry and the first in the family to commit suicide. A Reunion of Ghosts is a captivating chronicle of a family and the weight of consequences, which grows heavier with time. It's the quirky, dark comedy, family saga you'll want to read." And here's a little excerpt from the Publishers Weekly starred review: " Moving nimbly through time and balancing her weightier themes with the sharply funny, fiercely unsentimental perspectives of her three protagonists—each distinct, yet also, as their name suggests, at “different stages of a single life”—Mitchell’s fictional suicide note is poignant and pulsing with life force." Read the rest here. I should note that if you read our blog via Facebook, it's increasingly likely that you're not seeing it unless we boost it by paying. I think it's time for you to start subscribing, allowing it to show up in your in box. Sign up here! Boswell Bestsellers for the Week Ending March 21, 2015, Including Annotations and Journal Sentinel Reviews. Nothing new popped into our top five this week, but it's nice to see not just our current week's event, with Richard Price for The Whites, who was also a guest on Wait, Wait, Don't Tell Me this week, but also former event titles Epitaph and Leaving Berlin (and below in paperbacks, Lydia's Party). Some of this week's bestsellers are from the Women's Leadership Conference, and the other two are for offsite events that weren't part of our programming, and Erik Larson's event is sold out, so really, there's nothing to talk about this week. The big news is at #7, where for the second week, Pioneer Girl has been in our top. So glad that the South Dakota State Historical Society was finally able to reprint Pioneer Girl: The Annotated Autobiography. Oh, and while we didn't run out during the signing, by the end of Women's Leadership Conference we we out of On the Edge: Leadership Lessons from Mount Everest and Other Extreme Environments. We'll have more copies on Tuesday. Congratulations to Claudia Rankine, whose book Citizen won the National Book Critics Circle award for poetry. And we're thrilled to see the release of Antoine Laurain's new book, The Red Notebook, his follow-up to The President's Hat. Here's Anne McMahon's recommendation: "It may not be a complicated story, but what a story it is! Laure gets mugged. Laurent the bookseller finds her purse. He tries to find her. As he gets clues to her life and gets closer and closer, he finds himself wanting to know everything about her but at the same time, scared to meet her. It takes his precocious daughter (his fairy goddaughter?) to put them together. Such a delightful tale, perhaps even better than The President's Hat. I thoroughly enjoyed it!" Our How to be a Heroine promotion is going strong, where now you can also pick your favorite heroine, enter our drawing, and win a copy of...How to be a Heroine! Time for Jane Glaser's recommendation: "Traveling the Haworth moors of the Bronte sisters sets off a query between the author and her friend as to whether Jane Eyre or Catherine Earnshaw is the more admired heroine. Part memoir of growing up in an Iraqi-Jewish family and part informed commentary, readers will travel on a literary journey of self discovery, focusing on the impact that the joy of reading has on shaping our lives, in all its fluidity. Revisiting the heroines of her favorite books, among them as diverse as fairy tale's The Little Mermaid, to Jane Austen's Lizzie Bennett, Thomas Hardy's Tess, E M Forster's Lucy Honeychurch, Margaret Mitchell's Scarlett and Melanie, Salinger's Franny, Sylvia Plath's Esther Greenwood, the author also interweaves a reflection of her life as a writer with the inspired storytelling of Scheherazade. So engaging and enjoyable was this book that it sent me back to the back to the bookshelves to rediscover my favorite heroine!" This week's top 10 is completely event driven, and like the adult list, there are authors who came to town who did not do a public event, like Barney Saltzberg. What a great day two schools had celebrating Beautiful Oops. For J.A. White, we did the opposite and had two public events, in addition to our three school visits. If you haven't dived into The Thickety series, start with The Path Begins and you'll want to continue with The Whispering Trees. The great thing was that at all the events, lots of kids had read the books already and they were so excited to talk to the author about the books (and since Jerry White teachers third grade, he certainly was the perfect person to talk to him about it.) If you are at a K-12 school within commuting distance of Milwaukee, what are you waiting for? Sign up with Phoebe for our authors in schools program. Over at the Journal Sentinel, Jim Higgins offers his take on Jill Ciment's new novel, Act of God: "Forgive me, mycologists and 'shroom-heads, but few things unsettle me more deeply than the unexpected discovery of fungi where fungi are not supposed to be. Adult twin sisters Edith and Kat make such a find in the opening of Jill Ciment's novel Act of God: 'A small phosphorus organism, about as bright and arresting as a firefly's glow, bloomed in the seam of the hall closet.... A swell rose out of the glow until the head of whatever was fighting to get born pushed through... Kat gasped. Her breath must have disturbed the new life, or awakened it, because a puff of spores sprayed out, luminous and ephemeral as glitter. 'Oh dear." And also from Jim Higgins, here's that Richard Price (writing as Harry Brandt) review of The Whites. "The Whites grips a reader as firmly as any cable or pay-cable cop show you can think of — plus it offers the rich texture of Price's deeply informed writing." If you now feel the desperate urge to see Price in person, my apologies, but it was yesterday. Perhaps it's time to sign up for our email newsletter. But you should also note that we do have some signed copies. And reprinted from the Miami Herald, Connie Ogle waxes about Phil Klay's Redeployment, just in time to encourage you to read the book and come to our May in-store lit group discussion on May 4. Hanging Out at the Women's Leadership Conference with Carly. As we do every year about this time, today Boswell sold books at the UWM Women's Leadership Conference. The opening speaker was Erin Brockovich, but go figure, she doesn't actually have any books in print at this time. For the lunch, the lead was Alison Levine, author of On the Edge: The Art of High-Impact Leadership., and goodness, was she dynamic! Nowadays you wonder how these offsite events are going to go, but the attendees were crazy over her talk and the call to buy was very strong. Publishers Weekly wrote: "In her assured, personable debut, Levine-team captain of the first American Women's Everest Expedition and a former associate at Goldman Sachs-takes lessons learned on the slopes of the world's tallest mountains and applies them to everyday business challenges for executives at all levels, as well as politicians, educators, and students." Another attendee was Bonnie Marcus, the author of The Politics of Promotion: How High-Achieving Women Get Ahead and Stay Ahead. We had a little mix-up with the publisher and our order sat in their in-box instead of being processed. Fortunately we were able to get copies from our wholesaler Ingram at the last minute and in another shout out, our UPS driver adjusted his root today so that we could get our delivery a bit earlier. I offer Lois Frankel's quote today, as we sold a copy of one of her books at the conference: "If you're one of those nice girls who thinks politics is a four-letter word, think again. From promotions to perks to plum assignments, savvy women know the path to success is paved by politics. "The Politics of Promotion" will help you to make workplace politics an integral part of your skill set without feeling as if you've compromised your integrity." Our focus for the event, besides selling books, was getting the word out atbout Jessica Hagy's event on April 27 for The Art of War Visualized: The Sun Tzu Classic in Charts and Graphs. I made a special quarter-page flier, and handed it out to anyone who showed interest in either The Art of War Visualized or her previous book, How to Be Interesting (In Ten Simple Steps). Hagy does a great job; we had a wonderful program with her last time. One person bought out our stock of Interesting, and headed to Boswell to buy more. It's a good book; I hope she shows up for the event. I haven't been reading too many business books of late (The Great Beanie Baby Bubble is more of a business narrative than a how to, but one book I'd read through and particularly appreciated the program (which we saw at Winter Institute) for is Yes, And: Lessons from Second City, by Kelly Leonard and Tom Yorton. The authors use the model of Second City Works, the training unit of the famed comedy operation in Chicago and Toronto, to show how the rules of improv can improve communication, team-bulding, sales, and more for corporations, nonprofits, schools, and other organizations. Our Event with Erik Larson is Sold Out for March 24. We're sold out of the Erik Larson event as of today! We just heard back that the Wauwatosa Libray Luncheon is sold out as well. That means a lot of things to do. Update the signs, web page, and write this blog. Get a press release out. And of course, figure out the options. Didn't get a ticket? You still have three great options. All the details are here on this lovely sign. B. We’ll have a post-event signing line outside Boswell, which we expect will start between 8:30 and 9 pm. C. Not able to attend? Buy a copy of Dead Wake and we’ll get it signed for you. For this event, you must purchase your Dead Wake ahead of time, whether you get it personalized or not. D. And here's a fourth option - why not come to our events with Stewart O'Nan (Friday at 7 pm) and/or Richard Price (Saturday at 2 pm). They are also amazing writers. And if you missed out, make sure you're getting our email newsletter and don't forget to open it. There's important stuff in there. "Epitaph" Reviewed in "The Washington Post", Mel's "Jam on the Vine" Review in "Lambda Literary", and Our "How to Be a Heroine Display" is a Work in Progress. I don't usually sit around waiting for a review, particularly after an event has happened, but I've been on pins and needles to see if The Washington Post would review Mary Doria Russell's Epitaph, particularly since Ron Charles practically begged for a sequel. And while Russell has really only written one direct sequel, she does write her books in thematic pairs. So yes, a really great review finally came out, but it wasn't done by Charles. Instead Steve Donoghue, another enthusiastic fan of Russell's work at the Washington Post, rode in to her rescue. Donoghue writes: "The Gunfight at the O.K. Corral has been dramatized in numerous books, on stage, on screen, and in one particularly far-fetched episode of Star Trek .” In Epitaph, Mary Doria Russell revisits the iconic shootout, delving into its dramatic back story and aftermath. With vast amounts of research and a poetic prose line, she puts the hard kernel of the gunfight’s violence at the center of a setting as wide and complicated as the young United States itself. It's a remarkable accomplishment..." and there's nothing but rave from there on out. We've still got a number of signed first editions available. We haven't had too many Boswellians reviewing for other publications, but Mel Morrow recently had a review published in Lambda Literary for Jam on the Vine. If you've chatted with Mel in store, you know how much she loves this book, and that enthusiasm is redoubled here. She starts: "Recall your first reading of a favorite book: pulse quickening with resonance, your fascination with this new, yet familiar, world fueled by desire to forfeit reality for another moment with characters who feel like old friends. That expansive, lingering ache when life calls you to set the book aside, and the heady rush of picking up where you left off in the pages. This is how I felt the first time I followed Janie through Zora Neale Hurston’s Their Eyes Were Watching God, the intensity and depth of that adventure a singular event until recently when I met Miss Ivoe Williams in the pages of LaShonda Katrice Barnett’s breathtaking debut novel, Jam on the Vine." And this should grab you: "Jam on the Vine will resonate with many kinds of readers in myriad ways. Not only is it a well-researched and historically accurate account of southern African American survival, northern migration, and identity formation, it is an arresting real-world allegory." If I didn't have ten upcoming event books I had to read in the next week, I'd drop everything and read this right now. And yes, we ran out of books today. But we're back in stock on another Grove Atlantic winner, H is for Hawk. Speaking of books that a Boswellian is crazy about, we're working on our display for How to Be a Heroine: Or, What I've Learned from Reading Too Much, by Samantha Willis. Jane and Jen came to me and asked to do a display, and it has several moving parts to it, so it's taking a while to put together. First of all, booksellers are going to pick their favorite heroines, and we'll have bookmarks (made yesterday) explaining our choices. Then we'll have a drawing (I hope that will be done today) where customers can tell us their favorite literary heroine and enter a drawing for a copy of How to be a Heroine. We'll put the choices on Twitter (thank you) and add the best ones to our display. This Week's Boswell Happenings: Phillip Norman on North Africa tonight (Monday), J.A. White at Elm Grove Library (4 pm) and Boswell (6:30) on Wednesday, Stewart O'Nan on Friday (7 pm ) and Richard Price on Saturday (2 pm), Both at Boswell. Plus a Little About Mary Nohl Day at the Public Museum and Last, Last Chance to Get Erik Larson Tickets. In the next week, we have not one but two authors whose latest books were featured on the front page of The New York Times Book Review. Phillip C. Naylor is professor of History at Marquette University in Milwaukee, Wisconsin, where he directed the Western Civilization program. His previous books include The Historical Dictionary of Algeria and France and Algeria: A History of Decolonization and Transformation. In the dark world of The Thickety, 12-year-old Kara lives an outcast’s life as a suspected witch. When she was six years old, her mother was convicted of the worst of all crimes: witchcraft. Years later, Kara and her little brother Taff are still shunned by the people of their village who believe that nothing is more evil than magic…except, perhaps, the mysterious forest called the Thickety that covers nearly the entire island. After discovering a strange book with unspeakable powers – a book that might have belonged to their mother—Kara and Taff flee to the only place they know they won’t be followed: the Thickety. But the Thickety’s unknown magic lurks behind every twist and shadow, leading the children down a dark and wicked path. J.A. White is the writer for the book trailer production company, Escape Goat, as well as an elementary school teacher. Whether you live on the East Side or West Side of metro Milwaukee, we've got a J.A. White event for you. That's 4 pm at Elm Grove Library and 6:30 pm at Boswell. The Elm Grove Library is located at 13600 Juneau Blvd, north of Bluemound Road, east of Moorland Road. For more info, contact the -library at (262) 782-6717. Today F. Scott Fitzgerald is widely revered as one of America’s greatest writers, and with recent releases of both books and movies adapting his work or re-imagining his life, his reputation has swelled to almost mythic proportions. While he and his wife Zelda were celebrities in the 1920s, by the late 1930s Fitzgerald had fallen out of the public eye and into harder times. It is this period that critically acclaimed novelist Stewart O’Nan brings vividly to life in West of Sunset. Maureen Corrigan writes in The Washington Post review: "As he has demonstrated in Last Night at the Lobster and Emily, Alone, O’Nan is a writer alert to the courage and beauty inherent in the stories of people who simply have to keep on keeping on. What interests him about Fitzgerald’s exile in Hollywood is not so much the glitter (although Humphrey Bogart, Marlene Dietrich and other stars make appearances), nor his love affair with gossip columnist Sheilah Graham (whose blond good looks evoked the young Zelda), but rather Fitzgerald’s anxious commitment to his work as a screenwriter. Most of the movies Fitzgerald was assigned to were dreck (although there was a short stint on Gone with the Wind). Nevertheless, sitting down every day in his office or the various furnished cottages and apartments he rented in and around Hollywood, Fitzgerald fueled himself with cigarettes and Cokes (or, frequently, something more potent) as he labored to make flimsy scripts better. Fitzgerald was always a worrier, relentlessly tinkering with The Great Gatsby and Tender Is the Night, even after the publication of those novels. It’s that F. Scott Fitzgerald — the worn-out yet relentless craftsman — whom O’Nan compassionately evokes in West of Sunset. Stewart O'Nan is author of many previous novels and works of nonfiction, including his collaboration with Stephen King on Faithful, their book about being a Red Sox fan. Michael Connelly, writing about The Whites in The New York Times: "Written under the pen name Harry Brandt, his new novel, The Whites, is as much an entertaining story as it is an examination of the job of policing. It’s a job that’s difficult to do right. It’s even more difficult to do safely — especially when you try to prevent it from slowly hollowing out the holder of the badge. The novel posits a simple axiom: Those who go into darkness as a matter of course and duty bring some measure of darkness back into themselves. How to keep it from spreading like a cancer, eating at your humanity, is the police officer’s eternal struggle. It’s this struggle that Brandt places at the heart of his storytelling. Another great so-called crime novelist, Joseph Wambaugh, has said that the best crime novels aren’t about how cops work cases, they’re about how cases work cops. This holds true, with fervor, in The Whites." Don't miss this interview with Richard Price on Fresh Air. 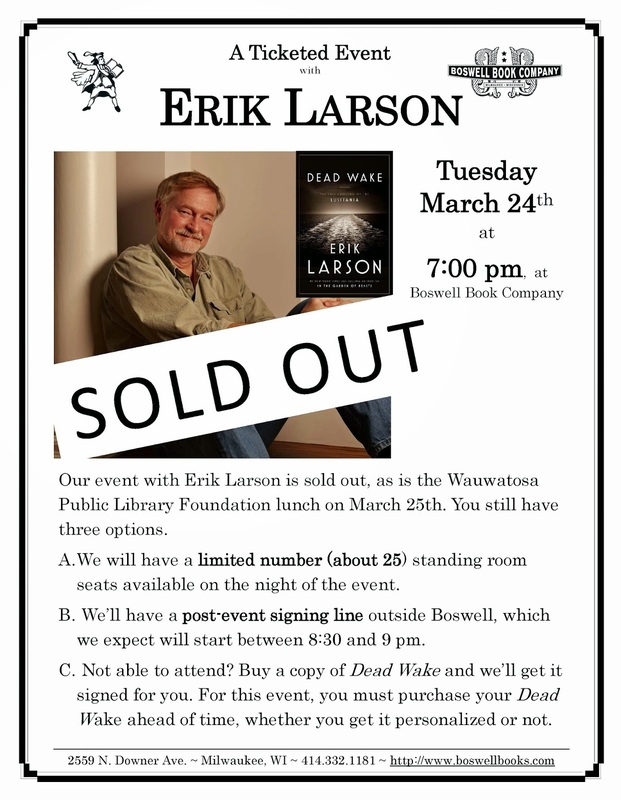 Thirty tickets left for Erik Larson, author of Dead Wake. Boswellian Anne McMahon says: "I suspect that like most people, I knew the bare facts of the Lusitania sinking. The full story as revealed by author Erik Larson is both fascinating and tragic. The depth of Larson's research is amazing and his writing ability produces history that reads like a novel. The past comes alive in a book that is a must-read." Jim Higgins at the Journal Sentinel writes: "Larson's book is a work of carefully sourced nonfiction, not a novelization, but it has a narrative sweep and miniseries pacing that make it highly entertaining as well as informative. As Larson points out more than once, a single decision or twist of fate out of many possible turning points could have resulted in the liner arriving safely in Liverpool." Read the rest of the review here. Don't forget, Boswell closes at 5:30 to the general public for this special event. Tickets (as 2 pm Monday) still available. One last thing, This Saturday, March 21 is Mary Nohl Day at the Milwaukee Public Museum, celebrating the release of the new absolutely delightful picture book, In Mary's Garden, by Tina and Carson Kugler. It's free with Museum admission. 10 – 11 a.m.: Presentation by authors Tina and Carson Kugler and discussion by Mary Nohl historian Debra Brehmer followed by a book signing. 11 - 12:30 p.m.: MPM Art Room open for all guests – create rock art jewelry, a fish, a pet rock or a moai sculpture. 1 - 2 p.m.: Presentation by authors Tina and Carson Kugler and discussion by Brehmer followed by a book signing. 2 – 3:30 p.m.: MPM Art Room open for all guests – create rock art jewelry, a fish, a pet rock or a moai sculpture. Boswell-a-palooza: Our Annotated Bestsellers for The Week Ending March 14, 2015. The second novel from Hanya Yanagihara, A Little Life, has been getting a lot of press attention. This story of "bright young things moving to New York" as, Entertainment Weekly put it, got a B+ from them. Leah Greenblatt writes: "A Little Life is not a little book—at 720 pages it’s a massive, sometimes maddening read—but it is a little bit of a bait and switch: Roughly halfway through, the other characters move to the margins, and Jude’s story takes over." And Claire Fallon in The Huffington Post notes: " Emotionally harrowing yet full of rather implausible sources of comfort, A Little Life somehow throws readers between the most unlikely extremes of horror and joy that life holds, making for a compulsively readable if artistically flawed sophomore effort." Our buyer Jason was a big fan of Yanagihara's first novel, The People in the Trees. Today's New York Times has a column, this one from Frank Bruni, about why the chase for elite schools and the subsequent rejections, can offer a tunnel vision view of success, with several stories that parallel Malcolm Gladwell's profiles in David and Goliath. We've also been seeing an explosion of online options, from for profits, new style nonprofits and traditional schools offering online options, so it's not surprising that Kevin Carey's The End of College: Creating the Future of Learning and the University of Everywhere is popping on our bestseller list. Carey was recently on Fresh Air, where he discussed the state of higher ed. Here's hist take on college admissions: "The problem with college admissions is that colleges don't really know that much about students. All they kind of have to go on is an SAT [or ACT] score, which is kind of a blunt instrument ... a high school transcript, which is sort of hard to figure out, [and] maybe a personal essay, who knows who wrote the personal essay. So they tend to fall back on, 'Is this person a legacy? Did they go to a good high school?' Well, everyone figures out where 'good high schools' are and people pay a lot of money in tuition if it's a private high school, or in the real estate market to buy a house near the good high school. And so again the opportunities for students to go to particularly elite colleges that are often the stepping stone toward the best jobs in government or business are in many ways constricted to a narrow band of people." OK, An Elm Creek Quilts Companion may not exactly be fiction, but it made sense to shelve the books with the novels and by the time I separated out the lists, it was too much work to move them around. I have so many issues with bestseller classification that you can give us a little wiggle room here. At her recent talk at the Weyenberg Library, Chiaverini was asked if there would be any more Elm Creek novels. For now, she's finished the series, but she said that for fans, they actually are rewarding on second read, as lots of details were placed in early volumes that play out later, and readers will get a kick out of spotting them. I should also note that Chiaverini talked up Mary Doria Russell's novels Doc and Epitaph. Jane continues to hand-sell How to be a Heroine, from Samantha Ellis. This week we're going to work on putting up a display around the book, so we can sell even more copies. Grace Labatt recently reviewed the book in The Santa Fe New Mexican. She writes: "What would happen at a cocktail party attended by literature’s great heroines? Gone With the Wind’s Scarlett O’Hara would try to teach Lizzy Bennett (Pride and Prejudice) to flirt, Franny Glass (Franny and Zooey) would do a soft shoe, and Mildred Lathbury (Excellent Women) would accidentally gets tipsy on sherry. Lizzy would laugh at Scarlett, who wouldn’t seem to mind.Samantha Ellis’ vision of the most fabulous imaginary bash ever follows her close study of each heroine above, along with many others. In How to Be a Heroine, which is part literary criticism, part memoir, she revisits characters from her life as a reader in order to reassess her initial readings (or, she speculates, misreadings) and to reflect upon her own arc — her moments as some sort of a heroine." Tieing in to our bestseller Big Nate Lives it Up, the currrent season of First Stage is currently featuring Big Nate: The Musical, now through March 29. Mike Fischer reviewed the show in the Journal Sentinel, observing that "true to Lincoln Peirce's beloved Big Nate cartoons — true, for that matter, to the spirit of musical theater itself — just about everything in Big Nate is similarly exaggerated, generating humor from the resulting disconnect between the average 11-year-old's humdrum life and the unfettered world of the sixth-grade imagination, in which a heightened view of reality hasn't yet been entirely cut down to size." Moving from the theater reviews in Tap to those of books, Journal Sentinel, Jim Higgins reviews Dead Wake, the new book from Erik Larson whom we're hosting on March 24. We're not quite sold out, but if you are planning to come, you should buy your tickets now. Higgins writes: "arson's book is a work of carefully sourced nonfiction, not a novelization, but it has a narrative sweep and miniseries pacing that make it highly entertaining as well as informative. As Larson points out more than once, a single decision or twist of fate out of many possible turning points could have resulted in the liner arriving safely in Liverpool." Buy your ticket now. Kevin Lynch reviews Gateway to Freedom: The Hidden History of the Underground Railroad, special to the Journal Sentinel. His take? "At the author's best, the sheer number of escapes, heroes and villains carries the reader along, as if galloping through a valley of subterfuge and salvation that might also doom freedom at any time. One fugitive's betrayal pivots on both a southbound carrier pigeon and a "stool pigeon." The stories convey the sometimes breathtaking effect of the spontaneously growing collaboration between whites and blacks." Lynch also suggests further reading. --The Fifth Gospel, by Ian Caldwell, is "a scholarly and suspenseful thriller" set during the last days of John Paul II. It's also the #1 Indie Next recommendation for this month. --On Firebreak, by Tricia Fields: "Fields' descriptions of people are sharp and pointed (Billy is 'utterly confident in his long-legged swagger') and the landscape of west Texas with its flat mesas and jagged mountains has a presence as real as her characters." --Cuba Straits, by Randy Wayne White is the latest Doc Ford mystery. Per Barrowman, the newest "Set in southern Florida and Cuba, this book sees Ford lured into helping his friend, General Juan Garcia, whose discovery of a set of love letters between Fidel Castro and a mistress results in lots of bad things happening." Mary Louise Schumacher discusses the new children's book, In Mary's Garden, by Tina and Carson Kugler. These former Milwaukeeans (more specifically Shorewood and Whitefish Bay) authors have created a delightful story, on sale Tuesday, and the subject of Mary Nohl Day at the Milwaukee Public Museum next Saturday. Schumacher ties the book's release to the news that the Kohler Art Museum will not be moving the house to Sheboygan..."Which is why the Kuglers' book is precious. It is a way to linger with the scores of woodland sculptures of monsters and sunny-faced figures, examine the blocks of cheerful color and abstract, geometric forms that define the property. No patrol cars will shoo us away." And here is more on the National Book Critics Circle Awards winners.